Another one of the what seems like thousands of "A series specialists" from the 60's. Barwell sold the usual range of 850, 998 and Cooper S tuning equipment, including modified heads, cams and big carbs. 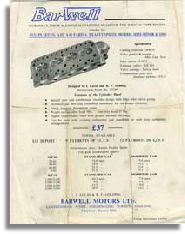 Their most interesting product however was a very well made and PATENTED design of alloy cylinder head. I have recently completed the restoration of one of these heads and have found it to be of a particularly good design and is both well made and of excellent high quality construction. The unique combustion chamber shape looks like it would certainly do the business for any small bore motor, but as with most of these early alloy heads the valve spacing prevents its easy modification for use on a big bore engine. I have recently come across a second design of Barwell head, that pictured above. This one is designated a "BARWELL / DERRINGTON" head and it was made to fit a 1300 / Cooper S type engine block. As you can see from the picture above it has 11 stud holes and the thermostat is orientated towards the front like all 1300 heads. Although it is still machined for 997 Cooper size valves (1.1" inlets & 1" exhausts) the valve centres are for a 1300 type engine. This is the only head of this type I have ever come across and I am trying to find more info on it at the moment. It is certainly a very rare beast indeed! Any further information on this version of the Barwell / Derrington head would be appreciated. you can contact me via the link on the front page. Read what Barwell had to say about their alloy cylinder head. 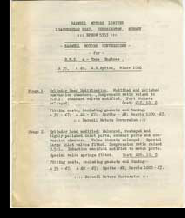 Check out the range of tuning equipment offered by Barwell in the mid 1960's. Manufacturer’s of an unusual cast alloy cylinder head.